You know, fall is a great time to plant a little garden. Which is exactly what we are going to do! Do you have the seeds, Dex? Yup. And also some pots, a couple of spades, a watering can and an old sneaker. Yeppers. 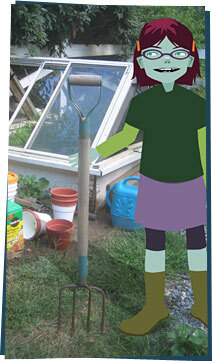 I found this funny site that says you can plant your garden wherever you want. So I am. And I will. So there. Ugh. For the record, I will never eat something that has grown out of your old shoe. Anyway, I thought we should maybe grow some things that Dad can't ruin with his cooking, like lettuce and carrots. And I'm going to plant sunflowers, because they grow like 10 feet tall and I can roast the seeds and I think they'll look really nice in my sneaker.